The splenic artery (in the past called the lienal artery) is the blood vessel that supplies oxygenated blood to the spleen. It branches from the celiac artery, and follows a course superior to the pancreas. The splenic artery gives off branches to the stomach and pancreas before reaching the spleen. branches to the pancreas multiple branches serving the pancreas including greater pancreatic artery and dorsal pancreatic artery. 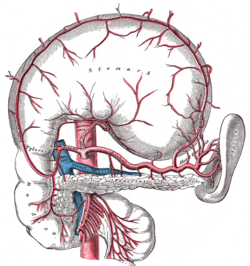 Note that the branches of the splenic artery do not reach all the way to the lower part of the greater curvature of the stomach. Instead, that region is supplied by the right gastroepiploic artery, a branch of the gastroduodenal artery. The two gastroepiploic arteries anastomose with each other at that point. Along its course, it is accompanied by a similarly named vein, the splenic vein, which drains into the hepatic portal vein. Splenic artery aneurysms are rare, but still the third most common abdominal aneurysm, after aneurysms of the abdominal aorta and iliac arteries. They may occur in pregnant women in the third trimester and rupture carries a maternal mortality of greater than 50% and a fetal mortality of 70-90%. Risk factors include smoking and hypertension. For the treatment of patients who represent a high surgical risk, percutaneous endovascular treatment may be considered. 3D-rendered computed tomography, showing splenic artery at upper right. ^ "UOTW #46 - Ultrasound of the Week". Ultrasound of the Week. 3 May 2015. Retrieved 27 May 2017. ^ Jamsheer NS, Malik M (2001). "Ruptured splenic artery aneurysm". Ann Saudi Med. 21(5-6): pp. 340–341. Accessed July 30, 2005. ^ Pauletto R, Mieres J, Incarbone A, García A, Santaera O (2013). "Exclusión de aneurisma esplénico gigante con técnica de catéteres mother-in-child en paciente de alto riesgo quirúrgico". Revista Argentina de Cardioangiología Vol. 4(1): pp. 62–65, Buenos Aires (Argentina): Colegio Argentino de Cardioangiología Intervencionista. ISSN 2313-9307, retrieved 11 September 2013. ^ Suzuki K, Prates JC, DiDio LJ (1978). "Incidence and surgical importance of the posterior gastricartery", Ann. Surg. 187(2): 134-136. Ruptured splenic artery aneurysm - a case report from Saudi Arabia. Anatomy photo:38:05-0101 at the SUNY Downstate Medical Center - "Stomach, Spleen and Liver: The Splenic Artery"